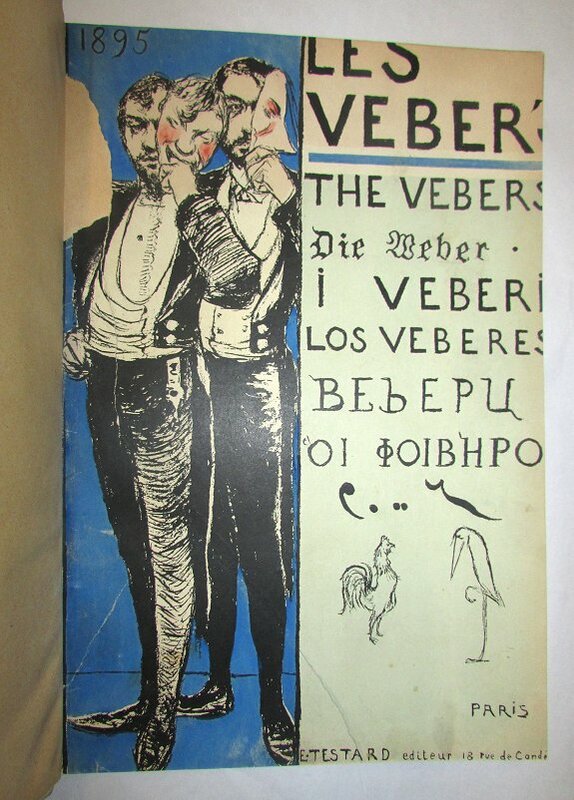 (VEBER, Jean and Pierre Veber). Les Veber's Les Veber's Les Veber's. Paris: Emile Testard, 1895. This seems to be the trade edition, two limited editions of 25 were published on �Japon imperial� and �Chine� paper. Inscribed warmly by Jean Veber to fellow artist and collaborator Eugene Cadel, signed by Pierre Veber. 4to., rebound in full vellum, leather spine label, original upper wrapper bound in, (183)pp. Profusely illustrated. Trimmed, though only loss is to bound-in wrapper; light soiling, small crack at foot of upper hinge, else near fine. 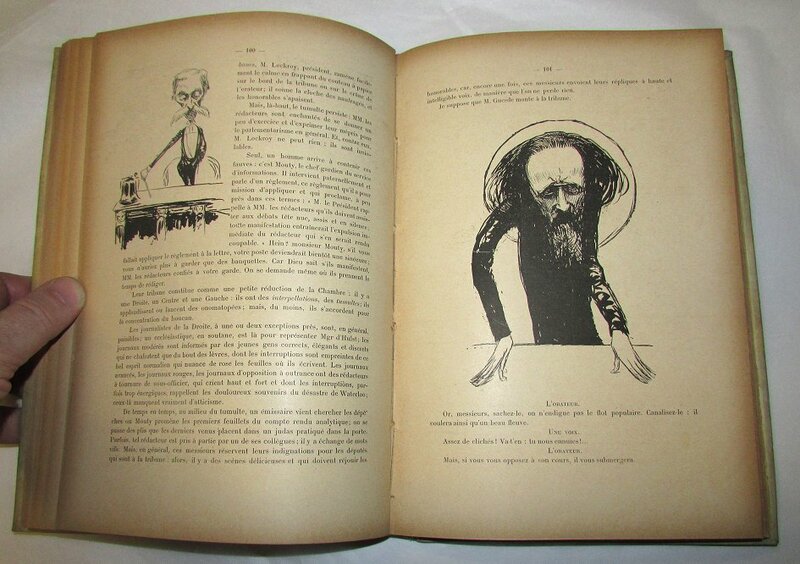 A satirical take on the Belle Époque by brothers Jean Veber (artist) and Pierre Veber (writer). Jean (1898-1928) studied with Maillol and later at the l'ecole des Beaux-Arts. His work often generated controversy, particularly a caricature of Bismark depicted as a butcher and an image for the coronation of Edward VII depicting an �his face on the bare bottom of a leering Brittania�. 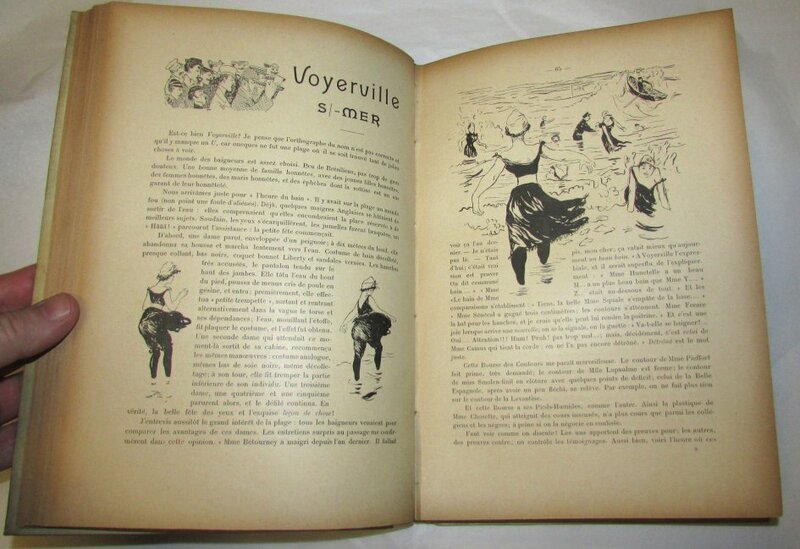 He worked on publications such as Le Rire, l' Assiette au Beurre, Lectures pour tous, Gil Blas, and l'Illustration. Pierre (1869-1942) was a prolific playwright and writer. �The author of over 100 plays and nearly fifty novels, collections of short stories, and humorous and ironic tales, he frequently collaborated with Maurice Hennequin.� Eugene Cadel (1862-1942) was a painter, writer, and critic who frequently collaborated with Jean Veber. Cadel's engraving workshop produced satirical images for L'Assiette au beurre, Le Sourire, Le Petit Journal supplément illustré, Le Matin, La Presse (for which he was also an art critic), and Les Annales politiques et littéraires. He was a board member of the Société nationale des beaux-arts and was made a knight of the Legion of Honour in 1927.